Exclusively presented by Drake Property, this secured and extra large CBD carspace offers you an unique opportunity to home you vehicle. It features: 14m2 on Level 5 Secure access, undercover Close to Townhall, QVB, Darling Harbour, Barangaroo and Pitt St Shopping Mall Please call or Joshua on 0408 422 771 for inspection. Modern 2 bedroom accommodation close to most amenities and next door to Ashfield RSL. Walk to trains and shops, Ashfield Mall and other specialty stores in the local area. Generous bedrooms with built in robes, open plan living area, internal laundry, bathroom and engineered flooring. The property is set behind a house facing Liverpool Road and is surrounded by trees and gardens. NB. Pet friendly For more information please contact Ray White Rentals on 0431 268 515 or John Shalala on 0405 535 611. Alternatively contact our office on 9747 2222 and speak with one of our friendly staff members. Secure and easy access Ht limit 1.9 meters 24 hours access via York Lane to park. Once parked, can exit into York St. Close to Wynyard Station, Martin Place, Darling Harbour, King Street Wharf and Barangaroo 37 York Street, Charted Accountants House is located opposite Wynyard Park. Right in the heart of city, close to Barangaroo and 1 min to Wynyard train station. Exit easily, no need to go round and round the car park to exit. Please call Joshua 0408 422 771 or Nicholas on 0418 115 776 for inspection. This 90sqm approx office has been freshly renovated with a high quality office fitout, including new carpets, glass partition offices, kitchen and accessible bathroom, downlights and data cabling. Great location with lots of visibility to passing cars, yet within walking distance of Newtown's King Street. Available as a whole office, or if you would like cheaper rent you could share the space with another tenant (Office for construction company with only a few staff). To inspect contact Beau Lyon on 0433870227. The Citymark building is located in Sydney's Chinatown fronting George, Hay & Thomas Streets offering commercial office space, retail shopping and dining establishments including the Marigold Restaurant, close to light rail and walking distance to Central Station. 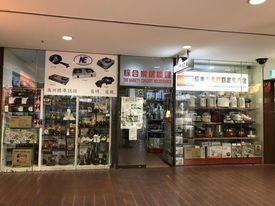 Features include: 40.5 sqm of prime retail space Floor to ceiling glass Corner position, connecting George Street & Sussex Street (to Paddy's Market) Opposite Bing Lee High foot traffic area Outgoings included in annual rent For any more information or if you would like to inspect this property, feel free to give Deans Property a call today! Single Carspace for Lease Minimum 6 month term 24/7 Secure access Close to Town Hall, QVB and Darling Harbour Easy in&out Available Now Please call Samuel on 0408 422 771 for inspection. Please call Sam on 0408 422 771 for inspection. Single Carspace for Lease Minimum 6 month term 24/7 Secure access Easy in&out Available from 24 August 2018 Close to Townhall, QVB, Darling Harbour and Pitt St Shopping Mall Please call Sam on 0408 422 771 for inspection. 2-person Private Office With Great Views And Access To Coworking Breakout Areas All-inclusive $923 weekly.. 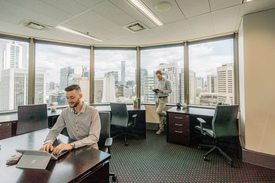 Enjoy a fully furnished private office located in Sydney’s best address. Designed to be "plug and play", this space is fully furnished with all IT and communications infrastructure provided. Market Street is a prime A Grade tower located in the West of Sydney’s CBD. The tenants and visitors of Market Street can enjoy the convenience of many on site retailers and services including convenient end of trip facilities. 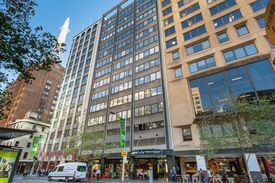 Located within minutes walking to Town Hall and the Queen Victoria Building bus stops, this building offers excellent transport connections, and many of Sydney’s landmark attractions are just a stroll away. What your weekly rent includes : • Fully furnished office with 24/7 access • Local phone number assigned with a dedicated receptionist to answer your calls • Impressive address on your website and collateral • High speed and secure Internet with 99.99% uptime • Connect with 40,000+ like minded business professionals • Community events to build your local network • Access to coworking and breakout areas • Modern kitchen facilities with complimentary coffee and tea • Pay as you go services including print facilities, administration and in house IT support. • Meeting room and boardroom access with member rates • Access to Servcorp's 160+ locations including 5 days free office usage outside your home state. Please contact us to arrange a tour today! Note Photos are representative of the workspaces you immediately get access to as part of your Servcorp membership. Outgoings are not included in the weekly price. Private 6-person Office With Views And Access To Coworking Breakout Areas All-inclusive $1,927 week.. Enjoy a fully furnished private office located in Sydney’s best address. Designed to be "plug and play", this space is fully furnished with all IT and communications infrastructure provided. Gateway at One Macquarie Place is a landmark building at Circular Quay, a stunning waterfront precinct in the heart of Sydney’s CBD. Gateway boasts breathtaking views of Sydney’s skyline taking in the Opera House and Harbour Bridge. 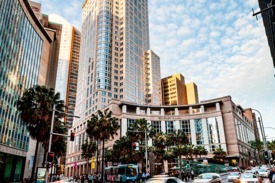 Directly across the road from Circular Quay train station, and adjacent to ferry and bus terminals, this building offers the best transport connections in the Sydney CBD. On site amenities include a café and bar, gourmet food hall, and convenient end of trip facilities. What your weekly rent includes : • Fully furnished office with 24/7 access • Local phone number assigned with a dedicated receptionist to answer your calls • Impressive address on your website and collateral • High speed and secure Internet with 99.99% uptime • Connect with 40,000+ like minded business professionals • Community events to build your local network • Access to coworking and breakout areas • Modern kitchen facilities with complimentary coffee and tea • Pay as you go services including print facilities, administration and in house IT support. • Meeting room and boardroom access with member rates • Access to Servcorp's 160+ locations including 5 days free office usage outside your home state. Please contact us to arrange a tour today! 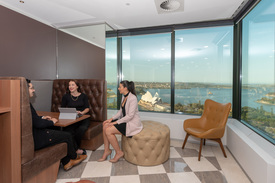 Premium 2-person Office With Spectacular Views At Gateway All-inclusive $1,096 week..
Modern Workspace For 3 People With Spectacular Views Of Sydney Cbd And Beyond All-inclusive $975 weekly.. Enjoy a fully furnished private office located in Sydney’s best address. Designed to be "plug and play", this space is fully furnished with all IT and communications infrastructure provided. 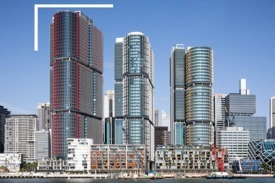 Barangaroo South is Australia's premier commercial hub for the Asia Pacific region. The building boasts spectacular views of Sydney Harbour all the way through to the city CBD skyline. Setting new standards in sustainability, Barangaroo is home to international banks, financial and professional service companies. This energy efficient office space is close to shops, cafes, restaurants, and cultural and fitness facilities. On site amenities include convenient end of trip facilities. There are direct public transport connections, including a major pedestrian connection through to Wynyard station and the city. What your weekly rent includes : • Fully furnished office with 24/7 access • Local phone number assigned with a dedicated receptionist to answer your calls • Impressive address on your website and collateral • High speed and secure Internet with 99.99% uptime • Connect with 40,000+ like minded business professionals • Community events to build your local network • Access to coworking and breakout areas • Modern kitchen facilities with complimentary coffee and tea • Pay as you go services including print facilities, administration and in house IT support. • Meeting room and boardroom access with member rates • Access to Servcorp's 160+ locations including 5 days free office usage outside your home state. Please contact us to arrange a tour today! Note Photos are representative of the workspaces you immediately get access to as part of your Servcorp membership. Outgoings are not included in the weekly price. Premium 5-person Private Workspace With Abundant Natural Light All-inclusive $1,408 week.. Enjoy Amazing Views From Your 6-person Collaborative Workspace All-inclusive $1,595 week.. Enjoy a fully furnished private office located in Sydney’s best address. Designed to be "plug and play", this space is fully furnished with all IT and communications infrastructure provided. Chifley Tower is a prestigious sky scraper positioned in the heart of the Sydney’s financial services and legal district. Designed to sit in harmony with its surroundings, Chifley Tower’s floor to ceiling windows showcase sweeping harbour and city views. It is only a stroll away from a myriad of Sydney's attractions and business focal points. The Chifley complex includes a food court, cafes, restaurants, a retail arcade, and end of trip facilities. What your weekly rent includes : • Fully furnished office with 24/7 access • Local phone number assigned with a dedicated receptionist to answer your calls • Impressive address on your website and collateral • High speed and secure Internet with 99.99% uptime • Connect with 40,000+ like minded business professionals • Community events to build your local network • Access to coworking and breakout areas • Modern kitchen facilities with complimentary coffee and tea • Pay as you go services including print facilities, administration and in house IT support. • Meeting room and boardroom access with member rates • Access to Servcorp's 160+ locations including 5 days free office usage outside your home state. Please contact us to arrange a tour today! Note Photos are representative of the workspaces you immediately get access to as part of your Servcorp membership. Outgoings are not included in the weekly price. Executive 1-person Office With Unlimited Access To Coworking Breakout Areas All-inclusive $548 weekly.. 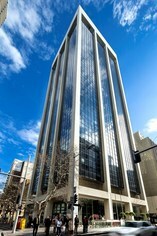 Enjoy a fully furnished private office located in Sydney’s best address. Designed to be "plug and play", this space is fully furnished with all IT and communications infrastructure provided. The MLC Centre is one of Sydney's most renowned office towers in the heart of Sydney’s CBD.The building boasts spectacular views across stunning Sydney harbour and city skyline. Located directly above Martin Place station, this building offers excellent transport connections as well as a food court and refurbished end of trip facilities. What your weekly rent includes : • Fully furnished office with 24/7 access • Local phone number assigned with a dedicated receptionist to answer your calls • Impressive address on your website and collateral • High speed and secure Internet with 99.99% uptime • Connect with 40,000+ like minded business professionals • Community events to build your local network • Access to coworking and breakout areas • Modern kitchen facilities with complimentary coffee and tea • Pay as you go services including print facilities, administration and in house IT support. • Meeting room and boardroom access with member rates • Access to Servcorp's 160+ locations including 5 days free office usage outside your home state. Please contact us to arrange a tour today! Note Photos are representative of the workspaces you immediately get access to as part of your Servcorp membership. Outgoings are not included in the weekly price. 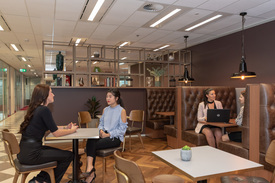 Collaborative Workspace For 6 People In The Prestigious Mlc Centre All-inclusive $1,664 week..
Executive 2-person Private Workspace With Access To Coworking Breakout Areas All-inclusive $764 weekly..
4-person Private Office With Unlimited Access To Coworking Breakout Areas All-inclusive $980 weekly..
An undercover car park located in Hordern Towers Sydney. Easy access to/from city, safe, secure and accessibly only with swipe card. Happy to arrange viewing. Security deposit for the swipe key. This approx 300sqm mechanical workshop has an excellent location on the high profile corner of Parramatta Road West St. With high internal clearance and plenty of space it previously operated with 4 hoists, and is now clear and ready to move in and start operating. Excellent signage opportunity, this building is well known as a local landmark. To inspect contact Beau Lyon on 0433870227. Secure basement parking within a boutique complex, a short stroll to Strathfield station, shops and amenities. Located at the Russian Club in Strathfield Basement parking within mere steps to Strathfield train station, Plaza, eateries and amenities.